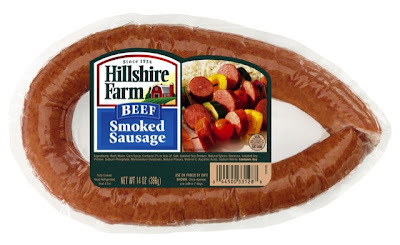 I wanted to share with you a quick meal that we do occasionally and we love because it's so easy to make.We love hillshire farm smoked sausage so we use it to add a kick to what could be a ordinary salad into an extrodinary salad. Begin with a bowl of Romain lettuce. Add in a handful of croutons. Take half of a tomato and dice it. Add some Colby jack cheese and a tea spoon of olive oil. Boil your smoked sausage for 10 mins over a low flame. One boiled cut into slices and then cut each slice in half. Toss on top of the salad and mix well. This is an easy meal that is a good source of protein and able to be made in under 30 mins. It's sure to be a hit. The Hillshire Brands many products offer many choices to Safeway shoppers to add protein into your families diet. Protein is a very important part of anyone's diet and with all the products Hillshire has to offer there is something for everyone. Safeway is currently offering coupons in their coupon center which can be found below by clicking the image. Safeway offers a awesome program they call J4U (just 4 U) which they send coupons to your email if you sign up.